PT Indofarma (Persero) Tbk - Indofarma is a reputable state-owned company in Indonesia, running business in the field of pharmaceutical and healthcare industry. Its business include production and distribution or pharmaceutical and healthcare products. 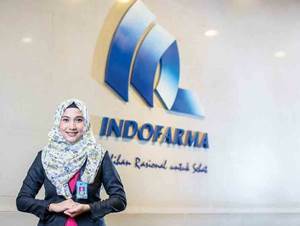 Indofarma is a public-listed company and its shares are traded on the Indonesia Stock Exchange (IDX) since 2001 under stock code INAF. Currently, the majority of Indofarma’s shares are owned by the Government of Indonesia (80.66%) and the remaining is held by the public (19.34%). Indofarma is based in Bekasi West Java and its head office is registered at Jl Indofarma No 1, Cikarang Barat Bekasi West Java 17530. Indofarma now supported by 2 subsidiary/affiliated companies, namely PT Indofarma Global Medika and PT Farmalab Indoutama. Operating knowledge of Computer with Windows and Macintosh Operating Systems. Have basic design skills using Corel Draw, Adobe Illustrator and Adobe Photoshop. JobsCDC.com now available on android device. Download now on Google Play here. Please be aware of recruitment fraud. The entire stage of this selection process is free of charge. PT Indofarma (Persero) Tbk - SMA, SMK Fresh Graduate Packaging Development Staff Indofarma July 2016 will never ask for fees or upfront payments for any purposes during the recruitment process such as transportation and accommodation.